A full soft drink bottle thrown from a distance hurtled towards me remarkably fitting through the gap in the glass and narrowly missing my head. Following the bottle was a barrage of verbal abuse from a patient in the Emergency Department (ED) waiting room. As I sat behind the ‘bulletproof’ glass, under a big red sign ‘Emergency Triage Nurse,’ I reflected on how the physical environment I worked in had been adapted over the last half century in a reactive response towards these types of aggressive behaviours exhibited by a few angry people. The interior design was rudimentary at best. The staff desk is completely enclosed facing off against long rows of bolted down hard plastic chairs. The drinking fountain and vending machines are all bolted down to minimise the risk of an object being used as a projectile, (the contents of the vending machine had been overlooked, but not on this day) complete with a television mounted high up in a corner to entertain the masses. In an attempt to make the staff safer this hostile environment with its institutionalised off-white walls and beige linoleum flooring, was anything but welcoming or calming and just another contributing factor to triggering people’s anger. This space was not making people feel calmer or alleviating their fears and frustrations, I did not feel safe, nor did I enjoy the drab environment I was working in every morning, afternoon or night shift. 1. Left , 2. Centre: Before my time. 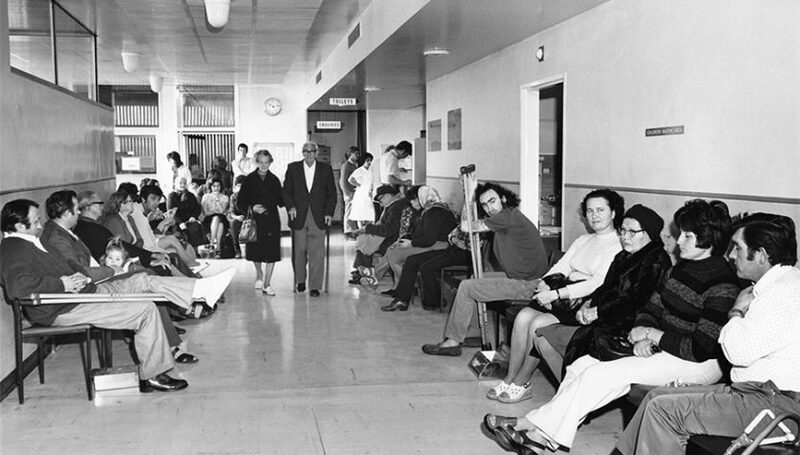 Western Hospital Footscray Emergency Department, 1978. 3. Right: Reactive design response. Bankstown Emergency Department waiting room. Design of hospitals is now changing and the response is proactive with investment being placed into the planning of these spaces. The needs of both patients and staff are emphasised and are an important focus in the design process and built outcomes. Architects involved in designing new hospitals and large scale refurbishments are using evidence-based research and involving hospital staff in the design process. This participatory design process is a long one, but adds immense value as it involves understanding how the emergency department waiting area is not just a ‘holding pen’. The ultimate goal is not only about making these spaces just aesthetically pleasing but understanding and responding to their spatial complexities, and the interactions of multiple user groups. There are many features of a waiting room, all are fundamentally important to be carefully designed in order for the space to function successfully. Some elements include intuitive way-finding to the department, the Emergency entrance, triage, clerical, security, waiting areas, amenities, lighting, noise, and privacy. These spaces also need to incorporate effective communication and information regarding system process ie. Triage, wait times, and patient flow. 4. Emergency Waiting Room, Royal Childrens Hospital, Melbourne. Billard Leece Partnership and Bates Smart. Photo by John Gollings. 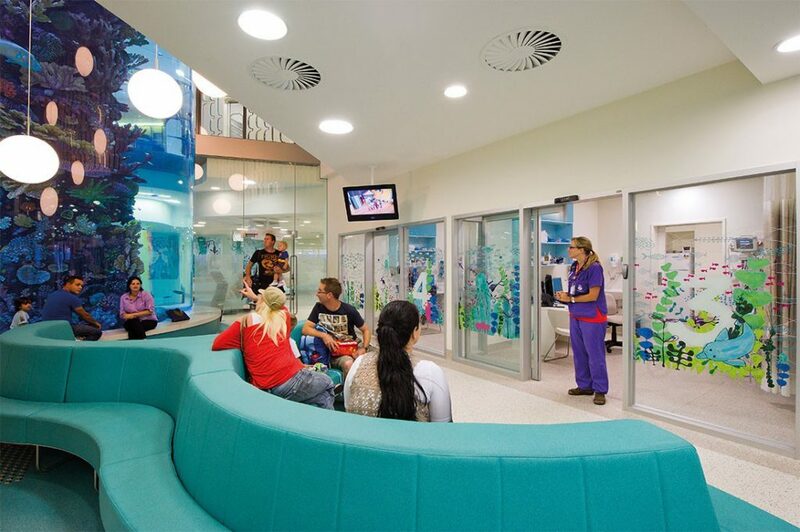 There is a very positive shift in the paradigm towards Emergency waiting room design, and understanding that the function is more complex than placing a few chairs in a room. A well designed waiting room will improve patient satisfaction thereby decreasing aggressive incidents, enable clear visual communication, inform and improve staff wellbeing, morale, and productivity… And will not include vending machines….